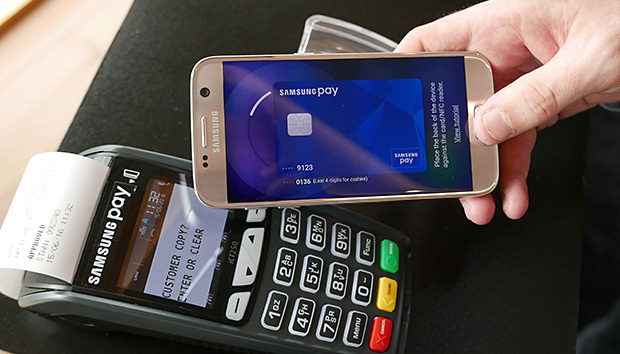 Security researcher Salvador Mendoza demonstrated a flaw in Samsung Pay at Black Hat last week, in which the tokens used to secure transactions could be predicted, and used to authorize fraudulent payments. Samsung responded with a statement calling the report "simply not true." "Samsung Pay is safe, secure and consumers can be assured that there is no known risk associated to using our payment service," the company said. But then, in a separate, more detailed document, Samsung admitted that it is possible to capture a token, but said that it was extremely difficult to do so. "This skimming attack model has been a known issue reviewed by the card networks and Samsung Pay and our partners deemed this potential risk acceptable given the extremely low likelihood of a successful token relay attack," Samsung said. The company did not respond to a request for additional information. Mendoza posted a follow-up video on Tuesday, again demonstrating the vulnerability. "I made this video without cutting or editing nothing from it making a transaction using MagSpoof," he said in a note posted along with the video. MagSpoof is an open-source application that lets users spoof magnetic stripe codes. "According to Samsung statement this transaction had to be declined. But it went through." "They are not addressing the main problem," Mendoza told CSO Online. In particular, the fact that an attack is difficult is not a particular barrier in a world where criminals routinely package and sell ready-to-go exploits to one another. "An attacker has to prepare a complete scenario to be successful," he said. "But that does not mean that it is complex or expensive. Basically, each tool that I made costs around $50. So many people with computer science knowledge could make something similar." He added that he notified Samsung about the issue in May, and the company asked him for more details about the vulnerability. "The communication was fluent and adequate," he said. "After many emails, I sent my presentation a couple of weeks before Black Hat. But after that, they did not respond any more related to the issues." What this shows is that Samsung is like every other company on Earth, which is fallible. "I've seen Mendoza's research, and watched the videos, and it seems like he's got a pretty airtight case, that's for sure," said security expert Jonathan Sander, vice president of product strategy at Lieberman Software. The main problem seems to be that the tokens generated by Samsung Pay are, to some degree, sequential, making it possible to predict future tokens. "I feel empathy for Samsung," he added. "Clearly they have done a lot to wrap this in secure layers. They might have committed an error along the way, the sequential thing, but they clearly took a lot of effort to protect it with many layers of protection and authentication. What this shows is that Samsung is like every other company on Earth, which is fallible." The initial reaction to downplay the vulnerability is a typical public relations move, he added. "You get some kind of breach, you get the first carpet-bomb marketing reply, and a week later a more detailed reply with a mea culpa and some sort of fix," he said. "Essentially, they're stalling for time, while they figure out how to fix this vulnerability." He added that Samsung may be under additional pressure because of its low market share in the mobile payments space. In late July, Apple announced that its Apple Pay platform accounts for three quarter of all contactless payment transactions, leaving just 25 percent for Samsung Pay and Google's Android Pay.